RM Friedland Named Exclusive Retail Agent For First Phase of RXR Realty’s 587 Main St.
A rendering of 587 Main St., currently under construction in Downtown New Rochelle. 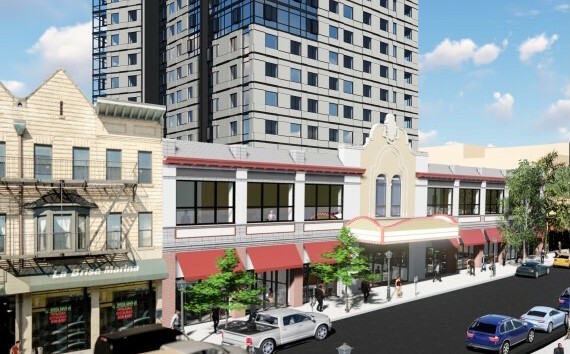 NEW ROCHELLE—RM Friedland has been named the exclusive retail leasing agent for 587 Main St., the first phase of RXR’s master redevelopment of Downtown New Rochelle. RM Friedland is responsible for all professional services surrounding the leasing of the retail opportunities at the location, including but not limited to: in-depth market analysis, marketing of the premises, community outreach to locate/negotiate with interested parties, development of promotional and marketing plans/activities. 587 Main St. is planned as a 280-unit, mixed-use luxury residential rental project, which includes approximately 14,000 square feet of retail space on the ground floor, a 10,500-square foot Black Box Theatre on the second floor and 294 on-site parking spaces. The Black Box Theater will be a technologically innovative Virtual Reality theater that is unlike anything presently on the East Coast. Four street level retail units are available for lease: the units range in size from 900-5,800 square feet. Construction is anticipated to be completed in the first quarter of 2019, which will mark the start of full building operations.